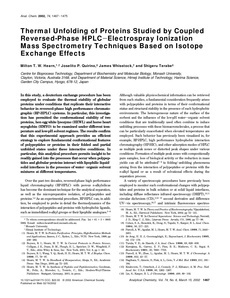 In this study, a deuterium exchange procedure has been employed to evaluate the thermal stability of globular proteins under conditions that replicate their interactive behavior in reversed-phase high performance chromatographic (RP-HPLC) systems. In particular, this investigation has permitted the conformational stability of two proteins, hen egg white lysozyme (HEWL) and horse heart myoglobin (HMYO) to be examined under different temperature and low-pH solvent regimes. The results confirm that this experimental approach provides an efficient strategy to explore fundamental conformational features of polypeptides or proteins in their folded and partial unfolded states under these interactive conditions. In particular, this analytical procedure permits insight to be readily gained into the processes that occur when polypeptides and globular proteins interact with lipophilic liquid/ solid interfaces in the presence of water-organic solvent mixtures at different temperatures.